Edith Up is a character from Rayman Origins. She is one of Betilla's sisters that is imprisoned in the mouth of a Darktoon, and is encountered somewhere in the Gourmand Land. When Rayman, Globox and the Teensies rescue her, she will give them the power to use funnels to change to different sizes. There is a PlayStation Network trophy/Xbox LIVE Gamerscore achievement, called Feed the Fairy!, which consists in a player rescuing her from a Darktoon. As her name might suggest, Edith is referred to as the Gourmet Nymph. She has long, curly blonde hair, wears a red bikini top and miniskirt, and also wears the hide of a red Baby Dragon Chef on her head. Her eyes are the smallest in the family, and her skin is noticeably tanned compared to her sisters, though lighter than that of Holly Luya. She is also larger than her sisters and she is more bustier than her sisters. When Edith is rescued, she is then seen on the map of the Gourmand Land before the players reach Mending the Rift, which is a level consisting of an Electoon bridge. If the players gather enough Electoons, she will grant them access to this level. Later on she is seen in the Luscious Lakes, before the players enter My Heartburn's for You, the boss level of this world. When the players reach Riding the Storm, the first level of the Moody Clouds, she is seen along with the other nymphs floating in the top right corner of the portal that leads to the Moody Clouds; once El Stomacho is defeated, she is lastly seen meditating. Edith Up trapped in the mouth of a Darktoon. Edith after she has been freed. Edith about to grant the player the power to change size. Her name is a pun on "Eat it up". 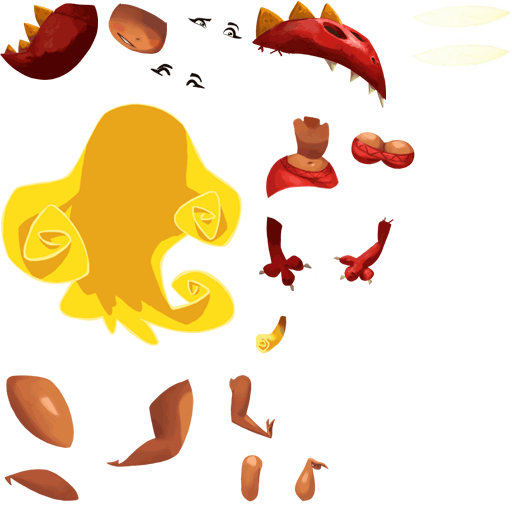 Sprites of Edith were ripped from Rayman Fiesta Run, with the updated shading seen in Rayman Legends, suggesting that she may have been planned for inclusion in the game at some point. This page was last edited on 28 January 2019, at 17:04.